A pair of lovers attempt to escape from a religious cult. The Colony treats its disturbing subject matter in such a superficial manner it often resembles a Women in Prison exploitation movie, albeit one in which none of the inmates ever take a shower. We learn nothing about the real Colonia Dignidad here, and we're left to fill in blanks throughout. 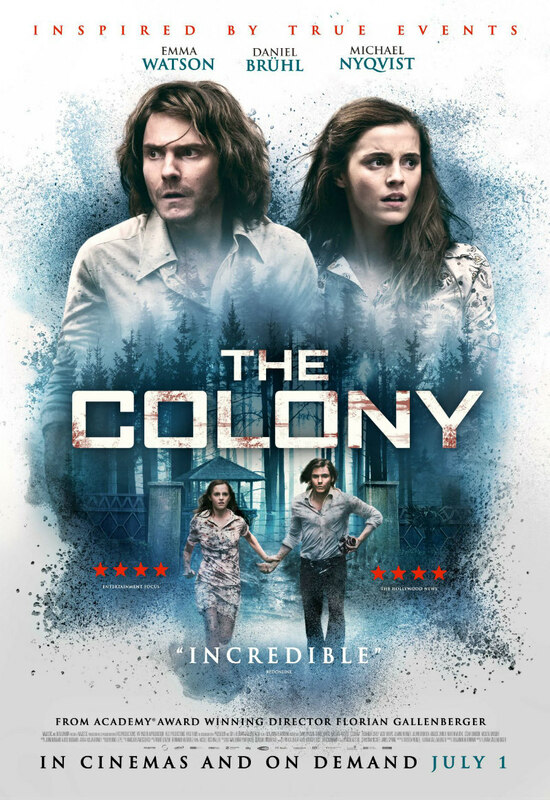 Released under the title Colonia for its US release earlier this year, The Colony takes as its backdrop the military coup that installed the notorious General Pinochet as leader of Chile in 1973, and the religious cult compound Colonia Dignidad ('Dignity Colony'), set up by German immigrants and used by the Pinochet regime as a secret centre for the torture and detention of the regime's enemies. 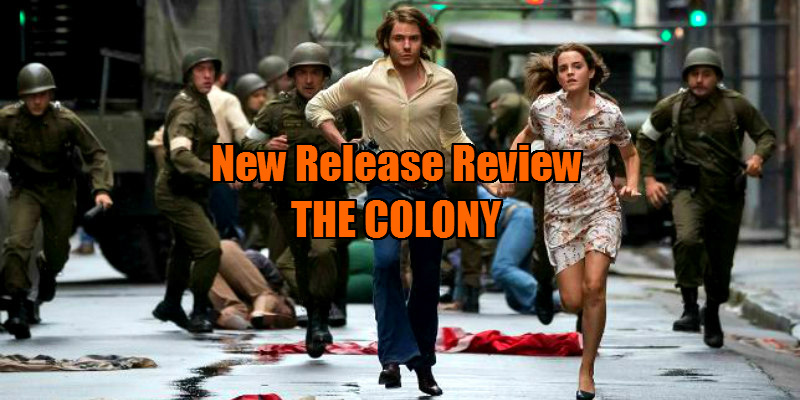 The Colony focusses on German airline stewardess Lena (Emma Watson) and her activist boyfriend Daniel (Daniel Bruhl). The two are enjoying a few romantic days in Santiago when Pinochet's coup breaks out and they are arrested by soldiers. Daniel is taken away to Dignidad where he is subjected to electro-shock treatment while questioned about his anti-Pinochet activities, but he refuses to talk, feigning mental illness as a result of his treatment in order to sneak around the compound without arousing suspicion. When Lena learns of his whereabouts, she willingly enters the compound and sets about freeing herself and Daniel. Director Florian Gallenberger's film may be set in a real time and place, but The Colony is little more than an exploitative prison break movie, not unlike something Roger Corman would have produced for the drive-in market back in the day, but a lot less fun. The cult leader, Paul Schafer (Michael Nyqvist), and his right hand woman, Gisela (Richenda Carey), are a pair of cartoon villains, never fleshed out or developed in any way that makes them resemble real people. Lena is subjected to varying degrees of abuse at the hands of both, but still manages to look like Emma Watson on the set of a Vanity Fair shoot. Daniel gets beaten so badly by his interrogators that a doctor remarks how he "may never look human again", but a couple of weeks later his boyish good looks have miraculously returned. It's impossible to believe Schafer wouldn't immediately know what they're both up to. The Colony treats its disturbing subject matter in such a superficial manner it often resembles a Women in Prison exploitation movie, albeit one in which none of the inmates ever take a shower. We learn nothing about the real Colonia Dignidad here, and we're left to fill in blanks throughout. None of the residents ever give a plausible explanation as to why they live under such harsh conditions. Women are subjected to emotional, psychological and physical abuse, which all the men seem to happy to take part in, with no motivation offered for such bizarre compliance. Lena's behaviour is far from credible. For a start, why does she enter the colony rather than informing the German authorities that one of their citizens is being held illegally? Later she puts herself willingly in a position she knows will result in her being abused and likely killed. The biggest questions arise over the odd alliance between Colonia Dignidad and Pinochet's regime, as the movie offers us no clues as to why the latter would seek the aid of an obscure religious cult. It's all too clear that the film suffers from its attempts to seduce an international audience. Had this been a German language production, it likely would have been able to spend more time painting a realistic portrait of its subject, rather than shoehorning in a Hollywood style romantic thriller plot. It's also highly distracting that Watson speaks with her own English accent while playing a German (I presumed she was playing an Englishwoman until well into the third act), unlike the rest of the cast who are predominantly from that nation, or at least make some effort to convince us of such. There's definitely a film to be made of this fascinating subject, but it will require a lot more subtlety and nuance than what's offered here, and will probably take a filmmaker from Chile to do it justice. Pablo Larrain, we're looking at you. Alongside its UK cinema release on July 1st, the film will be available to stream from We Are Colony, who offer a package of bonus content featuring b-roll footage, a short interview with Watson, production notes and cast and crew profiles.